Our tenth anniversary meeting on March 21 was a well-attended celebration with lots of time to enjoy cake after Sam Hunter’s fascinating talk. Erin welcomed new members with complimentary fat quarters and celebrated March birthdays. Thanks to Figo Fabrics, all members snagged a colorful charm pack on their way in the door. Erin challenged long-time members to chat with people they don’t know and reminded everyone car pools are being organized via the PMQG website. Additional announcements included a reminder that the April meeting has been moved to April 25th due to a religious holiday at the church. One of the guild’s business members, Cotton Cure, is now open in Hillsboro. Hunter’s Design Studio has joined the guild as a business member this month. Sam took us on a fascinating tour through the history of words on quilts and fiber arts, which ended in a very personal, and at times, teary story of her artistic evolution. Her talk culminated in her recently award-winning work “Why I’m A Feminist” which took third in the handwork category at QuiltCon. On display were some of her earlier works, including a series of stamped hospital gowns. 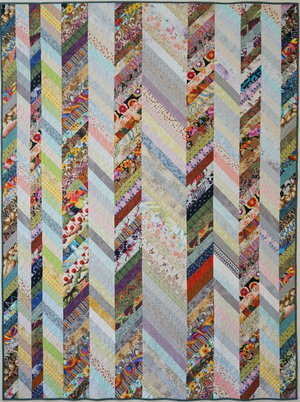 Irena Swanson will be teaching her Simple Herringbone Quilt Workshop on May 18th from 10-2. Irena is an expert at streamlining her sewing by sewing, and you’ll want to take this workshop to learn this process. The scholarship will be open for applications from April 27 - May 3, and the workshop will go on sale on May 4th. 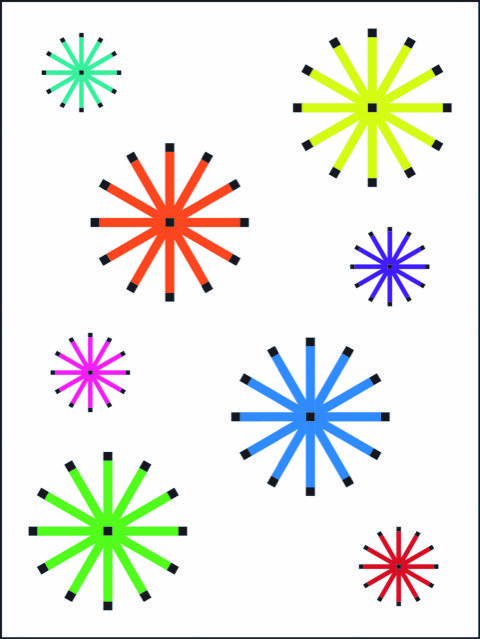 Sam Hunter will be teaching her Dingbats Redux Workshop on June 29th from 10 - 5. 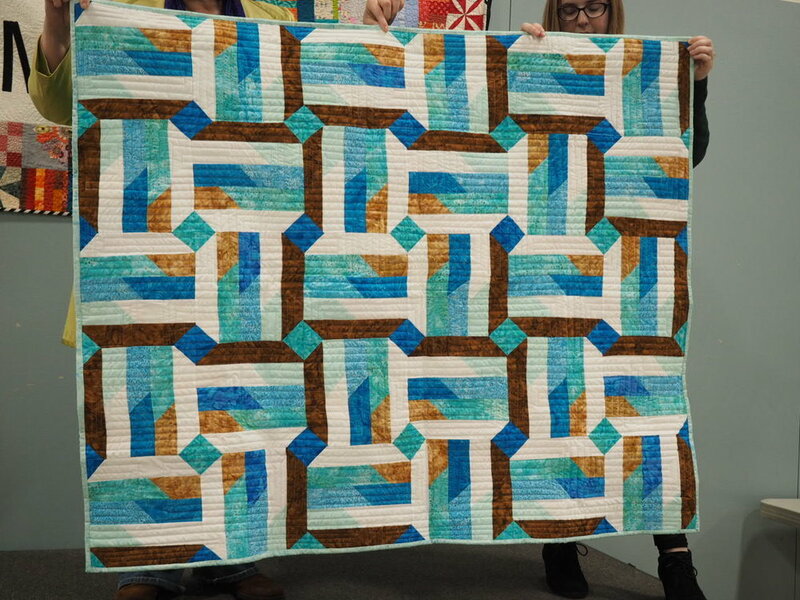 This dynamic quilt is made of two different sized blocks and is made without curves or set in pieces! The scholarship will go live for applications from April 27 - May 3rd, and this workshop will also go on sale May 4th. The Spring Retreat, happening in 3 weeks, is currently sold out with one on the waiting list. If you are interested, please sign up for the list as we’ve been able to accommodate several who wanted to add. The 2019 Fall Retreat will go on sale Saturday June 21 for people not attending the spring retreat. Registration will open to all 2 weeks later. 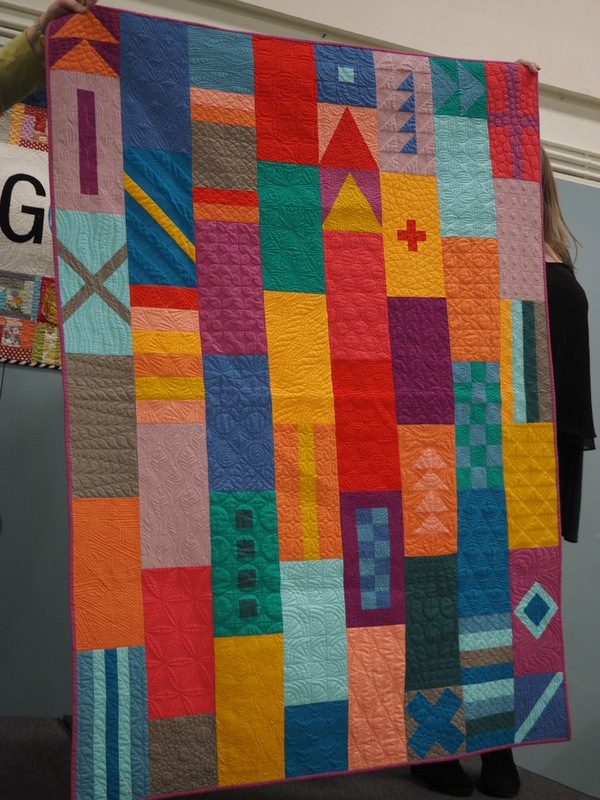 This past weekend, the PMQG sponsored an exhibit of our member’s word quilts at the Northwest Quilters 45th annual show. We will also have an exhibit at the Clark County Quilt Show March 28-30 in Vancouver. Umpqua County Quilt Show “Reflections of the Northwest” at Douglas County Fairgrounds in Roseburg April 26-28th . The March fat quarter swap of PMQG logo colors generated a lot of participation and Tracy Dunlap, Sailor Holladay, Renee Pype, Christine Yi, and Jessica Dahmen all took away stacks of more than 10 fat quarters each. 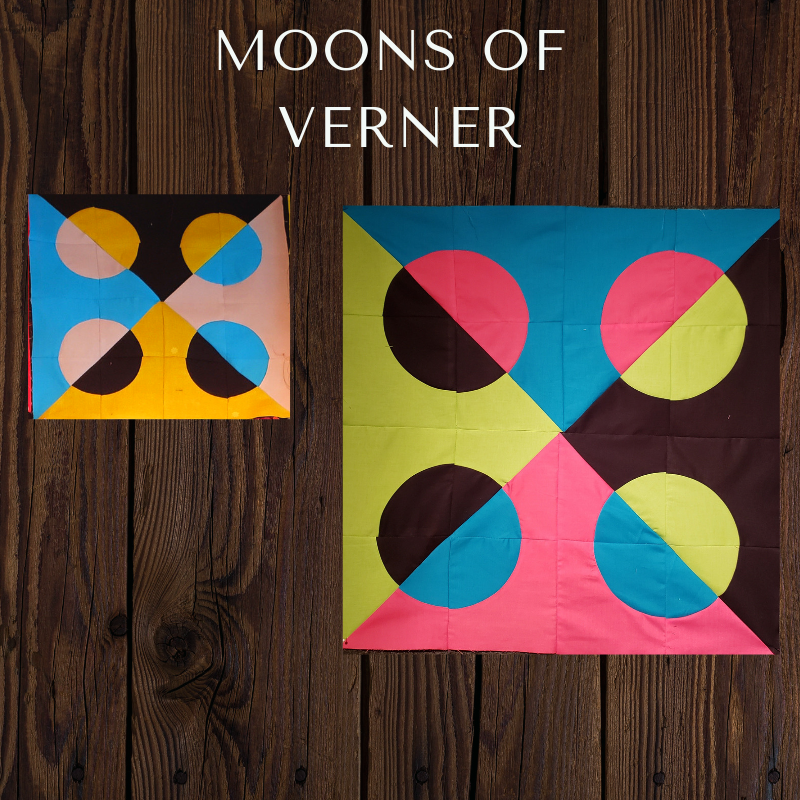 Sara Flynn introduced this month’s Block of the Month, Moons of Verner, continuing with the Mod Block Party theme. Be sure to download your instructions on our website. New VP of Technology and Social Media, Mary Ann Morsette, has organized a New Member Mixer on May 11 at Cool Cottons from 5:00-7:30pm. Cool Cottons will be closed, but members can shop and meet new folks while enjoying some light refreshments. 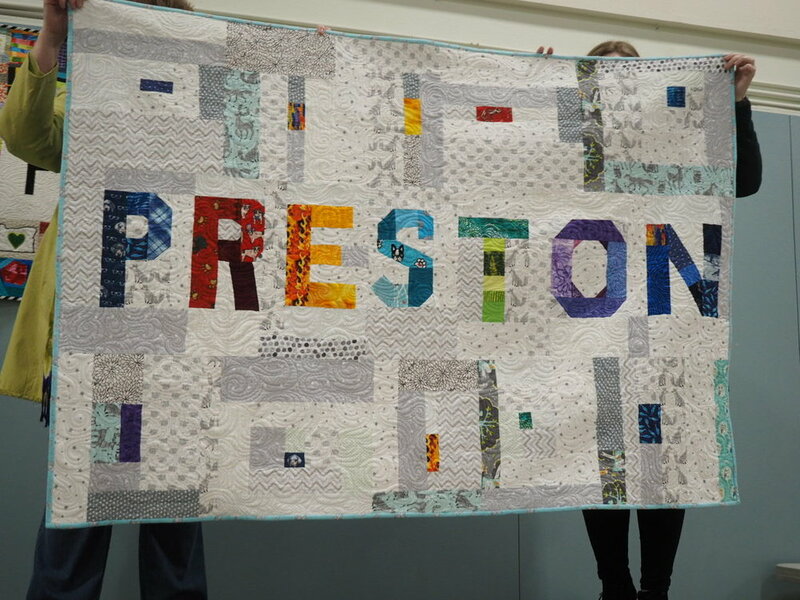 Once again, PMQG members proved to be generous and talented, donating 26 quilts to Doernbecher Children’s Hospital in February. This year, we are donating charity zipper bags to the Portland Homeless Family Solutions. Kits for both charity quilts and zipper bags are at the charity table. The board suggested a ruler library to supplement the book library the guild maintains. We need your input about what rulers you’d like included here. We had three Door Prizes for our March Meeting. 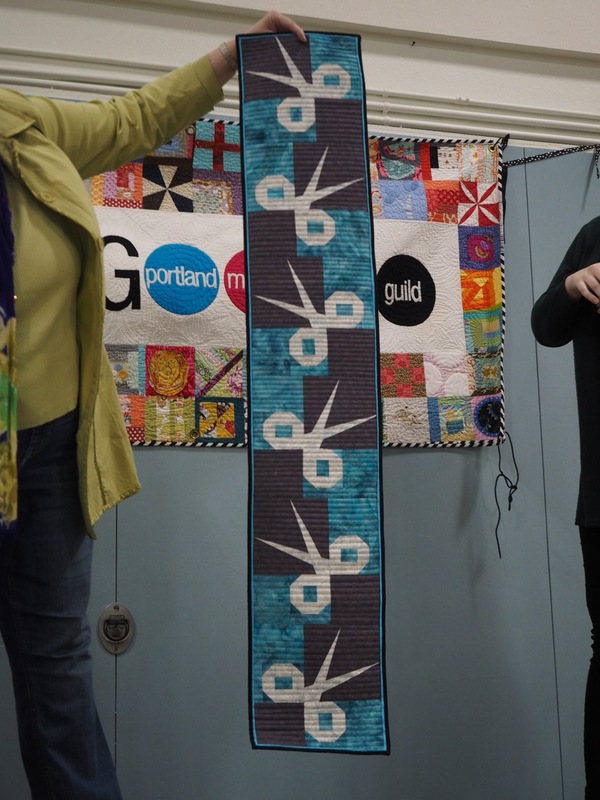 Our first set of prizes included a calendar from Curated Quilts, Island Batik fabric from Fabric Depot and the Mini Mod Dog kit from My Quilting Loft. This prize pack was won by Laurisa Stubblefield. Our second Door prize set was a calendar from Curated Quilts, 8 FQ from Figo Fabric’s Tropical Jammin’ collection and Soak and Flatter from Soak Wash. This prize pack was won by Petra Anderson. Our third set of prizes included a calendar from Curated Quilts and a 14 piece FQ bundle by Figo Fabric’s Mountain Meadow collection. This final prize pack was won by LouAnn Tiedemann. We finished our meeting with a fantastic Show and Tell! See you next month at our April guild meeting!